To coincide with the release of the new MacBook Pro with retina display, Apple has given its image editing software, Aperture, a significant makeover to position it as the ideal partner for the company's new laptop. 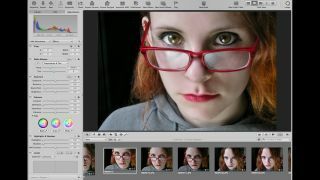 Aperture 3.3 is a free upgrade available to all owners of Aperture 3, and for the first time offers the possibility of uniting both Aperture and iPhoto image libraries into one handy library. This means that Places, Faces, slideshows and albums will work across both programs without the need to import and export files. Other significant improvements include the ability to use Camera-generated previews when importing raw files. Instead of Aperture having to re-render each image on import, the program will now enable you to use the raw file's JPEG preview. This makes for a much faster import process so you can get to work much sooner on your new images. The Shadows and Highlights tool has also been rewritten, and the complicated set of sliders have been replaced with just three adjustments: Highlights, Shadows and Mid Contrast. Purists might expect the new tool to be a bit simplistic and not as adjustable, but Apple seems to have got this right, and the trio of sliders work like a charm. White Balance has also been upgraded with a new Auto button as well as settings for Skin Tone and Natural Grey. Fortunately, the old-style Color Temp and Tint sliders are still there for those who like to do things the difficult way. Another new feature of Aperture 3.3 is the ability to drag and drop projects into a custom sort order rather than having Aperture dictate its own sort order. Faces has also been given the drag-and-drop treatment. Numerous other new features include a new Sharing button for publishing photos on social media sites such as Facebook. Sharing also includes, for the first time, an option to set a particular image as your Mac's desktop image. It doesn't sound like a big deal, but it's quite fun to change your Desktop on a whim without the faff of having to export the image and then use System Preferences to change your Mac's wallpaper. There are a host of other minor tweaks to this update, plus a new set of monochrome icons (instead of the colour ones of the previous version) and a more customisable browser that enables you to set the background brightness to suit your preference. The program code itself has been tidied up and the whole package feels snappier and more stable. Editing tools are far more responsive, which should mean less time spent staring at the dreaded spinning beachball of death. Aperture 3.3 is available as a free upgrade either via the App Store or the Software Update function. You can buy Aperture from the App Store for £54.99. More info at Apple's website. To run Aperture 3.3 you will need 528.37MB of spare disk space and a Mac running OS X 10.7.4 or later.